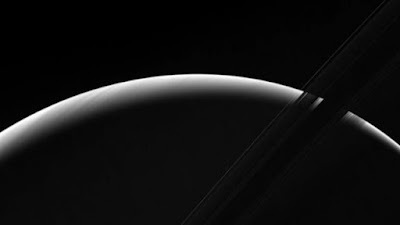 NASAs Cassini spacecraft has beamed back a stunning image that shows a sliver of Saturns sunlit atmosphere with its icy rings stretched across the foreground as a dark band. 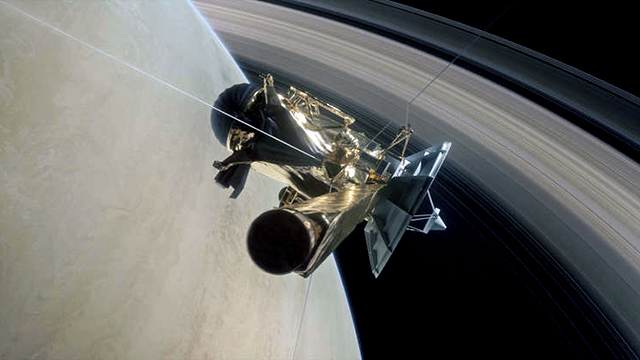 The Cassini mission is currently executing a series of daring ring-grazing dives as the mission comes closer to the culmination of its epic 20-year-long journey in space. The new image captures the unilluminated side of the rings from about seven degrees below the ring plane. The image was taken in green light with the Cassini spacecraft wide-angle camera on 31 March. The view was obtained at a distance of about one million kilometers from Saturn. After executing 22 dives between the planets icy rings, the spacecraft will plunge into Saturns atmosphere. The grand finale orbits bring the spacecraft closer to Saturn than ever before, providing stunning, high-resolution images and new insights into the planets interior structure and the origins of the rings, NASA said. During its final plunge into Saturn, Cassini will send data about the atmospheres composition until its signal is lost. Cassini has been a constant companion of Saturn for over 13 years, and at the end of its mission, it will become one with the gas giant. NASA is purposely de-orbiting the spacecraft as the space agency will lost control of Cassini when its fuel runs out. Cassini could then potentially crash into and contaminate the moons of Saturn, which may harbour life. The race to colonize our solar system and beyond is in full swing. There’s already an agreement between China and the European Space Agency (ESA) to set up a moon station. Intended to team up with private companies, the big agencies obviously have a clear vision for lunar exploration. NASA and the Trump administration are favoring private, US-based companies like SpaceX and even investment communities focusing on the moon, as well. Ambitions to achieve and reach milestones before going all in on Mars are driving factors. A lunar station just seems to be the next logical step. The NASA Scope and Subject Category Guide shows a lot of areas that will be exploited and its Space Technology Roadmap comes up with many interesting projects. It could start with the Deep Space Gateway, a new spaceport that orbits the moon, followed by smart robots that not only will build stations on the moon but seem destined to supply the earth with electricity produced on our satellite. 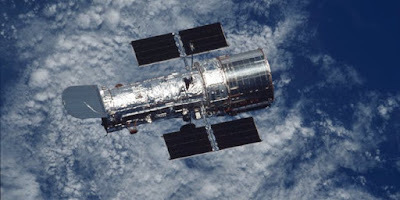 The Hubble Telescope's Greatest Hits Few of us accomplish this much by our 25th birthday. Earlier this year the Hubble Telescope turned 25. Ridiculed for its early bugs, the telescope soon allowed us to look deeper into our universe than we ever have before. It has miles to go before the James Webb Space Telescope replaces it in 2018. But this milestone was one not to overlook. Here are some of its most awe-inspiring photos, to the farthest edges of human perception, literally into the distant past. The Hubble made like your girlfriend on Instagram and captured this image of the so-called Large Magellanic Cloud using a set of filters — though these ones were infrared — to bring out the ocean-like scene above, which is a nebula that orbits our Milky Way galaxy. We’re all clamoring to get into space these days, but lost in our excitement to fly to the Moon and colonize Mars is a brutal truth: the final frontier is a cold, inhospitable wasteland that’ll kill you at the first opportunity it gets. 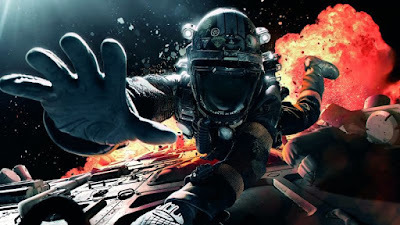 Astronauts already know this, but for the rest of us, here are just a few of the potentially lethal dangers faced by spacefaring pioneers. Exposure to the vacuumof space Let’s handle the most obvious danger first—exposure to vacuum. This is, as I’m sure would-be explorers are taught on the first day of astronaut school, something that would best be avoided.